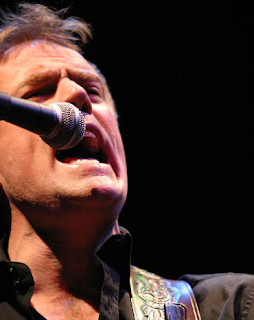 I met Martyn Joseph many years ago when he first played at the Vancouver Folk Music Festival. Working behind Main Stage as a volunteer, my primary responsibilities have been to provide hospitality to the artists in the “green room” and to assist the Main Stage crew with ensuring artists are in the right place at the right time when it’s their turn to perform on the evening stage. Martyn’s first time at our Festival was not the most pleasant of experiences for him. While checking into the hotel the night of his arrival, he turned his back for a moment only to look back and find that his luggage had been stolen! A laptop, pay from other performances and travel essentials, all gone in the blink of an eye! And here he was miles away from his home and family in Wales, celebrating his 40th birthday with not much more than his guitar! Martyn did not hold a grudge with Vancouver though. He took the stage and immediately won the hearts of all! In the cool evenings we shared warm clothing with him and when the audience members heard what had happened, many gave money to make up for his losses. He quickly became a favourite and every year since, we check the line-up in hopes of finding his name on it! Martyn’s deep and caring heart never ceases to touch me. His lyrics speak volumes and his genuine warmth is felt by all his fans. Martyn has been very encouraging as we’ve been working on the Project Somos Children’s Village vision. When I heard he would be in BC this Summer, I asked if he’d be willing to do a benefit concert for us. He immediately and enthusiastically said “yes”. I am thrilled beyond words. This means more than I can ever express. I can not wait until Monday evening when we get to sit in our dear friends’ living room and listen to Martyn. Which song am I most looking forward to hearing? Hmmmmm…. The Sum of Us? Dic Penderyn? Arizona Dreams? All This Time? One of Us? It is difficult to decide….